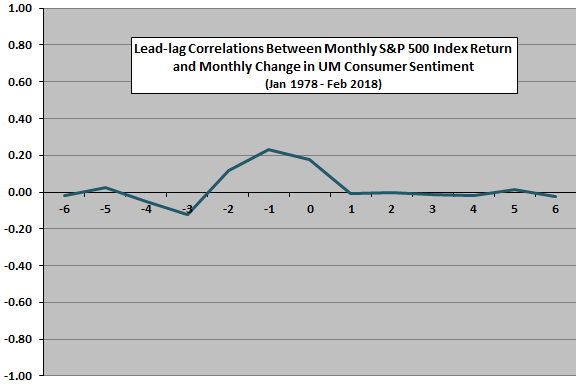 The following chart compares the behavior of the Consumer Sentiment Index and the S&P 500 Index (logarithmic scale) based on monthly data over the full sample period. Visual inspection suggests the two series mostly move together, but it is not obvious whether one series reliably leads the other. 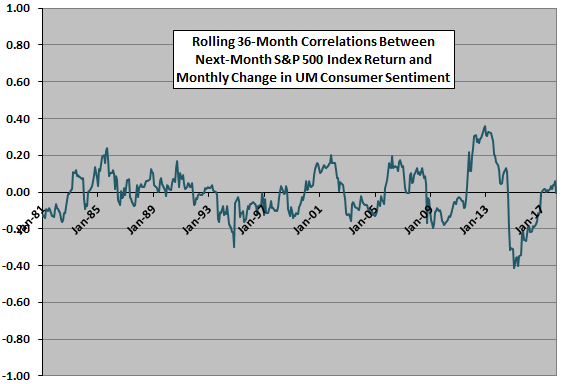 For a closer look, we relate monthly change in consumer sentiment to next-month stock market return. 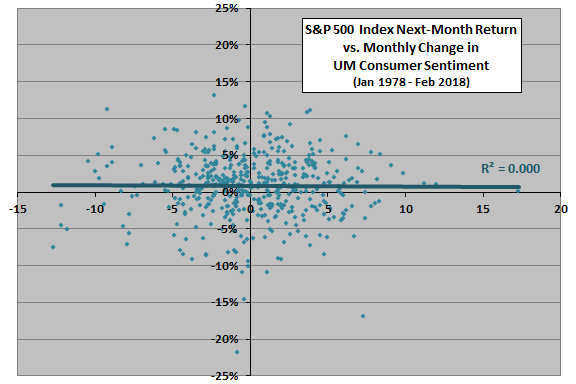 The following scatter plot relates next-month S&P 500 Index return to monthly change in the Consumer Sentiment Index over the full sample period. The Pearson correlation for the two series is -0.01 and the R-squared statistic 0.000, indicating that change in consumer sentiment has no power to predict stock market return. Is this correlation stable over time? The next chart tracks rolling 36-month Pearson correlation between next-month S&P 500 Index return and monthly change in Consumer Sentiment Index. Results indicate that, while the average correlation is near zero, it drifts higher and lower over relatively short subperiods. Might consumer sentiment changes predict stock market behavior beyond the next month? A stock market advance (decline) indicates an increase (decrease) in the Consumer Sentiment Index one to two months later. 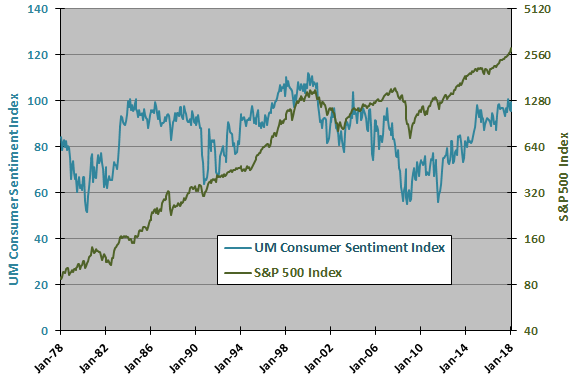 Contemporaneously, consumer sentiment and the stock market move together . A change in Consumer Sentiment Index does not predict stock market returns at horizons up to six months. In case there is a material non-linearity in the relationship, we calculate average stock market return by range of changes in consumer sentiment. 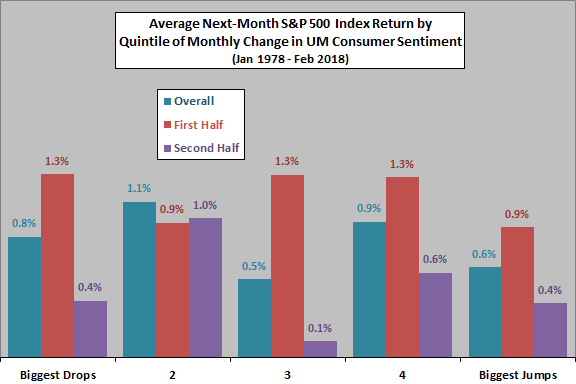 The final chart summarizes average next-month S&P 500 Index return by ranked fifth (quintile) of monthly changes in Consumer Sentiment Index for the overall sample period and two equal subperiods (break point at the end of 1997). There are 96 (48) observations per quintile for the overall sample period (subperiods). Progressions of average returns across quintiles are not systematic and results for subperiods are very different, indicating no exploitable non-linearities. In summary, evidence from simple tests offers no support for a belief that monthly changes in the University of Michigan Consumer Sentiment Index predict stock market returns at horizons of one to six months. Most of the above analyses are in-sample. As illustrated by the rolling correlation, an investor operating in real time with inception-to-date data may develop different, dynamic beliefs. The above analyses do not address preliminary consumer sentiment readings. This analysis does not rule out the possibility that surprises in the Consumer Sentiment Index, relative to some measurable expectation, usefully forecast stock market returns. There is a slight mismatch between monthly measurement intervals between the Consumer Sentiment Index and the S&P 500 Index. Precise alignment of intervals may have some affect on findings. The returns used above ignore any effects of dividends.